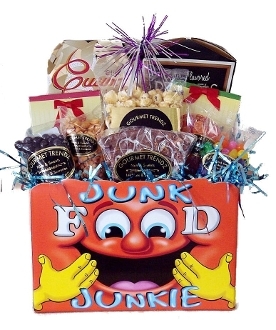 A Gift Basket for the Junk Food Lover! Contains an assortment of junk food snacks such as chips, pretzels, nuts, beef jerky, caramel corn, chocolate, candy, and popcorn. Assortment may vary. Great for many occasions for the junk food fanatic! All of our gift baskets are wrapped in cello and decorated prior to shipping or delivery. We also include an enclosure card with your personal message.